Steph and Stewart are celebrating their first anniversary. She’s an English teacher; he’s a high-school librarian. At the heart of the occasion, though, is a terrible sorrow. You see, Steph and Stewart arrived home from their blissful honeymoon to find that something terrible had happened. Darkly hilarious and deeply moving, this drama moves from pathos to humour and back again as a tragic story is revealed. A vivid portrait of two ordinary people to whom an extraordinary event has occurred, One Good Marriage speaks to our need for community. One Good Marriage won the NOW Magazine award for Outstanding New Play at the 2002 Summerworks Festival. Fork In The Road Theatre was founded in 2005 by director Mike Mackenzie as a way to showcase Canadian plays that speak of the human experience. The company previously produced the World Premiere of MUSE, written and directed by Mike Mackenzie, at the Tarragon Theatre Extra Space. 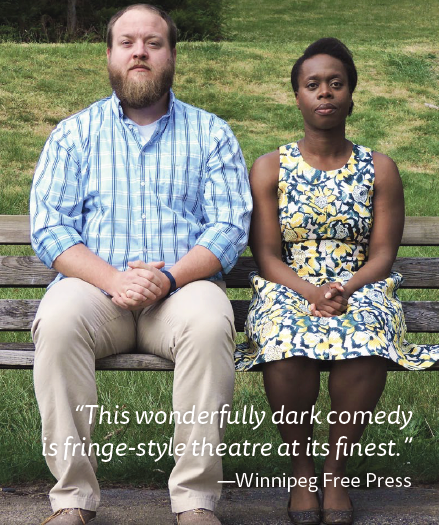 One Good Marriage marked the first production by the company in Vancouver, and was part of the 2016 Vancouver Fringe Festival’s Dramatic Works Series at the Cultch’s Culture Lab.